In Which Season Can the Tent be Used? CORE instant cabin tent can fit 6 people, and its dimensions are 11x9 feet. In case you like queen air mattresses, two of them can be placed in this tent easily. As this model has a pre-assembled frame built into it, the entire set up is super fast and takes only around 60 seconds. All you need to do after unpacking the tent is to unfold its legs until they click, and there you have it – everything is in position. CORE’s H20 technology includes water-repellent materials, sealed seams, and rain-proof windows and doors. This model only has one door, and considering its size, the manufacturer could have included one more. The tent has a mesh roof and two large windows that create great ventilation which will keep you cool even in hot weather. The walls of the tent have net pockets which are pretty big and can be used for storing your gear and possessions. One thing that this model is missing is a vestibule, which means that you will probably have to bring in your footwear into the tent in case of rain. Made for four persons, this tent is 9x7 inches big. It has a pre-assembled frame system that makes the setup very easy. All that it takes to set it up is three steps – unpack it, unfold it and extend the poles which click into position. It took probably less than a minute. It has more than enough room for four people; it’s pretty spacey. It’s a dome-shaped tent with a center height of 54 inches. It comes with a lantern with Ceiling Fan hook and pockets for all of your equipment. There’s an extra addition which I liked; it has the electric cord port which can be fully closed when not in use. With this tent, you will get a rainfly, tent stakes, and a carry bag. It can be used in all seasons, the ceiling lets the hot air out, and it has adjustable air intake vents to take in cool air from the ground. This is a big tent enough for six persons that takes about one minute to set up. It has pre-attached poles that allow that quick setup. It’s intended for bigger groups that are on long camping trips. It can be used for backpacking, even if the center height is 6ft. The tent is made out of strong polyester; it’s durable and sturdy. It’s good to use in the rain; the waterproofing system prevented leakage. The rainfly is included, and the airflow is great. For storage, there are only two pockets to keep your gear in. It can easily fit two large airbeds, and you will still have a room around them. Now, when it comes to strength it isn’t the strongest tent ever, and it won’t hold very well in the strong winds and storms. As for the good weather conditions, you will have nothing to worry about. This tent might require a bit more time to set up due to its size. You will have to unfold it, extend it and secure it in place. It’s divided into two rooms making it great for couples that go on camping together. The poles are pre-attached on the tent which makes the setup much easier than it would be without them. It has thick waterproof walls and welded floor which keeps you dry at all times. It has a lot of ventilation windows and two doors. The center height of the tent is 6ft, and it weighs 42 lbs. This weight makes it not the best choice for backpacking; it’s easier to bring it on a bike or in the back of the car. This one as the last didn’t perform that well in windy conditions and its poles are kind of flimsy. This tent can fit four people with even some extra space to spare. It’s a great tent for casual camping adventures, hiking, and festivals. It’s a portable tent that’s easy to set up, and it includes stakes as well. The peak height of this tent is 47 inches, and it has two doors on each side. The floor is waterproof, and the pole material is fiberglass. To set it up, you only need to remove it from the packaging and watch it pop. When you are ready to leave, just fold it back up, and that’s it. On each of the sides, this tent has windows for ventilation and air flow. Windows are not see-through, so you don’t have to worry about your privacy. The storage part is also covered, you will have enough room to store all of your gear inside. It lacks waterproofing, so I wouldn’t advise you to use it in the rainy conditions. To have better judgment and evaluation in this category, there are few important points from which you will be able to know is the tent you like good enough for you. These points determine which tent is the best instant camping tent on the market. Tents are built based on the place they will be used and the type of use. They come made for beaches, campsites, festivals, and backpacking. The use of the tent determines its size, weight and the season which he is built for. If you’re looking for a specific use of the tent check its description and you will see what he is meant for. The best tent ever would be suitable for all season, but most of them are for one season only. However, there are three-seasoned ones that will do just fine in summer, spring and fall. The best picks in the three-season category have ample mesh panels that have a better airflow while at the same time keeping the insects out. Be sure to check does the tent comes with proper pitching, he should have a taut rainfly. The best tents of the three-season group can withstand downpours although they don’t perform the best in the harsh storms, strong winds or snow. Choosing the capacity of the tent depends on your camping group. Have in mind to make sure that you have enough room for the gear and for everyone to be comfortable. Camping is all about relaxing in the first place. Portability is a big plus when you’re backpacking. It’s more practical to carry the tent in the backpack than to drag it in your car. Portability can be impacted by the size of the tent, its weight and the possibility to fold it up properly to fit in a backpack. 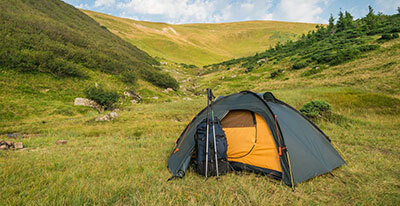 The best way to determine tent’s durability is to check which material is it made of. From fabric used for cover to the type of skeleton, tents can be made of carbon fiber, aluminum, etc. Check how the tent should be used and what it takes for it to be set up. It can require additional tuning to be set up completely, or the only thing required to set it up could be to throw it in the air. If you like your tent to be spacier so you can stand up in it, you should look for the tent that is tall enough to do that. You can check the listed height of the tent you liked. The maximum height depends on the tent’s style, you have cabin-style tents that have near-vertical walls to maximize the height, and some even have room dividers and doors. The other type are the dome-style tents; these have a high level of strength and wind-shielding abilities. Dome-style tents are the best choice to be safe during a stormy night. They have a much smaller livable space since they feature a tall center, and they slope on the sides. When you’re choosing a tent, make sure that the fabric is dense and that it has a rainfly. If the tent is made of dense rough fabric, it will be much more durable, and it will lower the risk of leakages. If you’re a tall person and usually you lack space for sleeping in the tent, look out for the tents that has a 90-inch floor length. The length of the floor is also a variable option, so check out the tent description and take a look at its floor length. Most family tents come as freestanding and do not require stakes to be used. To set it up faster go for only a few poles since they are easy to attach to the clips. To have a strong and durable tent, go with aluminum poles. If the number of doors is what you need when you go camping with a group, the best choice would be the instant cabin tent. The rainfly is a separate waterproof cover that goes over the roof of the tent. It helps the tent to retain extra warmth and to be protected from the rain. You will see two types of rainflies, the ones that go only on the roof, and the ones that cover the tent completely to offer the protection from the wind as well. 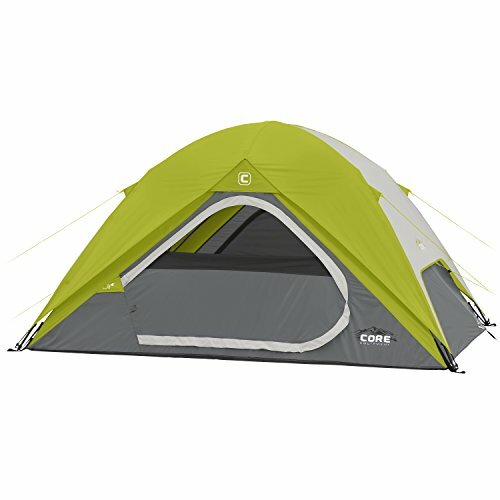 Check if the tent has interior loops and pockets. You will need a space to store all of the gear and pockets will help to keep everything organized and in place. For a better condensation and air supply, check the ventilation capabilities of the tent. It makes a lot of difference if you’re camping during the spring and the rain starts pouring. The best instant tent should be very easy to set up to live by its name. It’s a great solution for people that are not camping experts. It reduces the time needed to set the tent up providing more time for fun and relaxation. Having all of this features in mind, I have to say that the winner of this pick is CORE 4 Person Instant Dome Tent. It’s an ideal tent for group camping trips or families, completely waterproof and very easy to set up. The only thing that keeps it from being perfect is the lack of backpacking ability. I hope this guide was a help to your search for an instant tent of your camping dreams.